In August 1994 I travelled up to Northumberland in Freddie (my family's trusty 2CV) to search the archives in Morpeth and Berwick. I had a week to find out as much as I could and to visit the places mentioned. I had recently completed an Open University course in family and local history, so knew the type of documents to look at. Using information from an uncle and a second cousin I had already obtained the birth certificate of my greatgrandfather, Thomas James Stephenson: 8th July 1861 in Long Bank, Longhoughton. As the 1861 census had only been taken three months earlier, that was my first document to search. I found his mother (Elizabeth Margaret Stephenson) living with her sister, husband and three children. Using his mother's age, I went back to 1841 (the earliest English census) and after quite a bit of searching I discovered Elizabeth with her mum, dad and 8 siblings. They were all living in a hamlet just outside of Bamburgh called Burton. In 1851 they were living at Goldenhill, fairly close to the main railway line. Now known as the East Coast Main Line, the then Newcastle and Berwick Railway was authorised to be built on 31 st July 1845 and opened in 1847 (see map here). I wonder if any young Stephensons managed to watch any of it being built? It was the railway that was to transport some of the Stephensons to the Midlands in the early 1870s. Travelling to Northumberland again in 1995 and 2003, I was able to put more branches on the family tree. I discovered more of Thomas' cousins and that in 1871 he was living with the same people who his mother had stayed with ten years earlier: Thomas and Mary Weir. It's very interesting that when my greatgrandfather's first son was born in 1887, he was given the name Percival Thomas Weir Stephenson. Other names in the family have been taken from previous generations too - a common practice for many families. It was useful to search various Parish Registers whilst at the CRO at Morpeth. Using an Ordance Survey map I was able to widen my search through the Anglican and Presbyterian Registers. I discovered the baptism record of Thomas' grandfather (James Stevenson [sic] in Lesbury in 1791 and James' parents' marriage record in Alnwick in 1789: John Stevenson [sic] and Sarah Rickaby. Strangely, it is a special feeling to see the signature (sometimes "mark") of an ancestor from many decades ago. On the microfilm for the Secession Chapel of Burghers (Scotch Church) in North Sunderland, I found the baptism records for the first five children of James and Jane (née Young) Stevenson's [sic] children. They were: Mary (born 1821), Sarah (1823), James Young (1825), Jane (1827) and Charlotte (1832). Using Census Returns and Birth Certificate references, their other five children were Mark (1834), Thomas (1836), Ann (1837), Elizabeth Margaret (1841 - my greatgreatgrandmother) and Isabella (1844). Now that broadband is available and some companies have digitized many official records, it is far easier to research the wider family. There is no need to take an expensive trip to Northumberland or London to view certain records. Here you will find a graphic chart of the Northumberland Stephensons. They were married at St. Michael's in Alnwick on 1st August 1789 by Rev John Johnson. The witnesses were Thomas and Stanley Rickaby. They had at least three children: James, Thomas (died on 6th March 1872 in New Shoreston) and Charlotte (baptised on 24th June 1793). He was baptised in Lesbury on 9th January 1791. Being an agricultural labourer, he periodically moved around with his family to find work. Every census has him in a different place along the coastal strip of Northumberland. He died of old age on 29th April 1870 at New Shoreston. 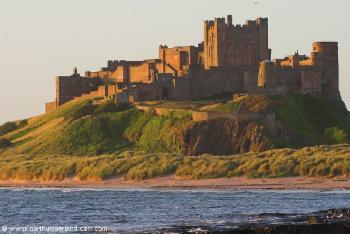 She was born near Bamburgh in about 1798 and married James. She had eleven children that I have discovered, possibly more. How hard must have that have been? She died near Tamworth on 2nd February 1883 - 250 miles away from her "home". I wonder if her possibly thick Northumberland accent was difficult to understand for those in Staffordshire and Warwickshire? Was it Jane that decided to move south after the death of her husband? Mary was born in Burton on 18th May 1821 and was baptised at the North Sunderland Secession Chapel of Burghers on 17th June 1821. She married Thomas Weir on 6th July 1850 in Warenford. Her sister Sarah was one of the witnesses. They had three children: Jane, Mary and Elizabeth Margaret. Jane married Benjamin Willock in 1877 in Tamworth. Mary married James Hall in 1879 in Tamworth. When I discovered that Elizabeth Margaret died aged four in 1864, I felt quite sad! It's funny how these people really do become your family. Thomas died in Hopwas, near Tamworth, on 5th May 1878. On the 1891 census, Mary Weir with Benjamin (who is now married to a lady called Mary) and two children are living in the Westgate area of Newcastle. Benjamin married Mary Shepard in Tamworth in mid-1887, after Jane died in late 1886. They must have moved back up shortly after. Mary Weir died in late 1891 in Newcastle. Sarah was born at Howey's Lodge, Bamburgh on 2nd July 1823 and was baptised fifteen days later. Being 17, Sarah was the only child who was then born, that didn't appear with the family on the 1841 census. James was born in Burton on 17th May 1825 and was baptised three days later. He married Martha Cobb in the early 1850s - I'm still trying to find their marriage certificate. He died in Lesbury on 2nd December 1907, whilst Martha died in Sunderland on 21st May 1912. I think they had seven daughters: Sarah, Jane Ann, Catherine, Mary, Martha, Isabella and Elizabeth Charlotte. Mary married George King in 1884 in Lesbury. Isabella married William Hindhaugh in 1893. Elizabeth married James Jamieson in 1897 in Alnmouth. Jane was born in Burton on 6th June 1827 and was baptised on 1st July. She has the surname Lawson on the 1851 census, where she is staying with her parents. I haven't discovered her marriage certificate yet. John was born at Burton on 22nd April 1829. Charlotte was born at Burton on 3rd June 1832 and baptised 23 days later. She was the first child to have "ph" (instead of "v") in her parents' surnames in the Baptism Register. Mark was born at Pasture Hill, being baptised on 7th January 1834. He married Jane Dixon on 28th March 1859 in Lesbury. His sister Ann was one of the witnesses. Mark and Jane had 6 sons and 2 daughters. Their eldest was John Dixon Stephenson, who was born on 7th April 1859 in Foxton Hall near Lesbury. J D Stephenson married Elizabeth Shepherd in 1888. Between 1889 and 1896 they had Sarah, John, Mark, Thomas and Rose. They were all born in the Cramlington area. Thomas, another son of Mark and Jane married Margaret Kirkup in 1893. On the 1901 census they are living with their children, Winnifred and Arthur. Thomas was born in 1836. Ann was born in 1837. In 1851 she wasn't with the rest of her family in Bradford. After a little bit of searching on Ancestry, I found her as a house servant in Byker (part of Newcastle). Robert (an Innkeeper, born in Ireland) and Ann Morris (born in Bamburgh) were also living in the house in William Street. Who is Ann Morris? How did 'our' Ann end up in Newcastle? Something else to try to discover! My greatgreatgrandmother was born at Shoreston on 12th February 1841. Her first son was born on 1861 in Long Bank: Thomas James Stephenson is my greatgrandfather. 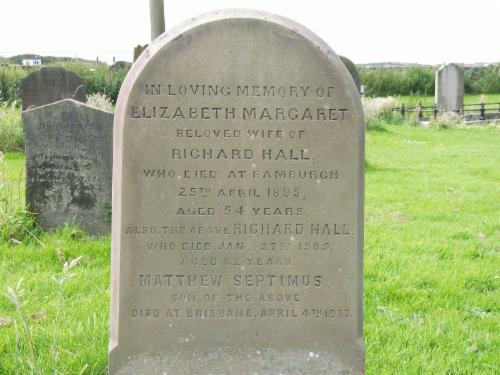 Elizabeth married Richard Hall, a widower, in North Sunderland on 18th May 1872. They had two children together: Mary Jane Young Hall (born 12th March 1873 in Bamburgh) and Edmund Hall (born 11th July 1876 in Bamburgh). 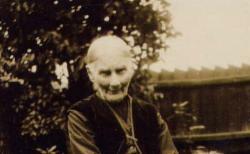 M J Y Hall was still living with her father in Bamburgh in 1901. Elizabeth had died six years earlier. In 1901 Edmund was living in Newcastle and working as a Railway Porter. He married in 1904 and had a son in 1906. Edmund died in 1961. His sister died in Belford in 1966. 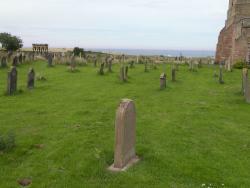 Elizabeth is buried with her husband in Bamburgh. Joss, a distant cousin, was good enough to draw a map of St. Aiden's churchyard for me with several family graves marked on it. It was a big help in locating Elizabeth's grave when I visited in July 2007. The photo on the right gives a broader view of the grave. On the left by the tree is Grace Darling's cenotaph, the North Sea is in the distance in the centre and the edge of St. Aiden's tower is visible on the right. She was born in July 1843 and had a son called James William Stephenson on 1st May 1872 at New Shoreston. She married William Harper in Tamworth on 16th October 1877 and died on 11th July 1934 in Tamworth, with her son being the informant. She was the informant on my greatgrandfather's death certificate in 1901. She is the only one of the original Northumberland Stephensons that can be remembered. It seems that in the last few years of her life, she was frail but still had her marbles. This photo was taken in about 1929. An uncropped version is in the photo album. James William Stephenson died in October 1938 at Tamworth Hospital. 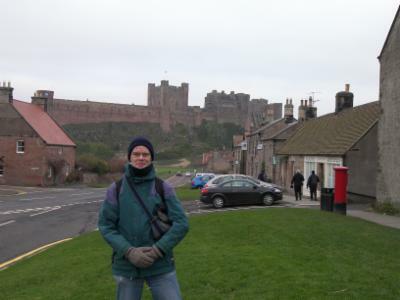 An interesting article was written in the Northumberland and Durham Family History Society Journal in Spring 2006. Written by Pat Steele, it was entitled Northumbrian Farm Workers. With Pat's permission, you can read it here. Grace Darling made a daring rescue to a stricken boat with her father (a lighthouse keeper) in September 1838, just off the coast of Bamburgh. Being born in the village in 1815, it is very likely that the Stephensons would have known this famous Victorian heroine. I remember hearing the story about her on Blue Peter in the 1970s, little realising that there was a geographical link to my own family.